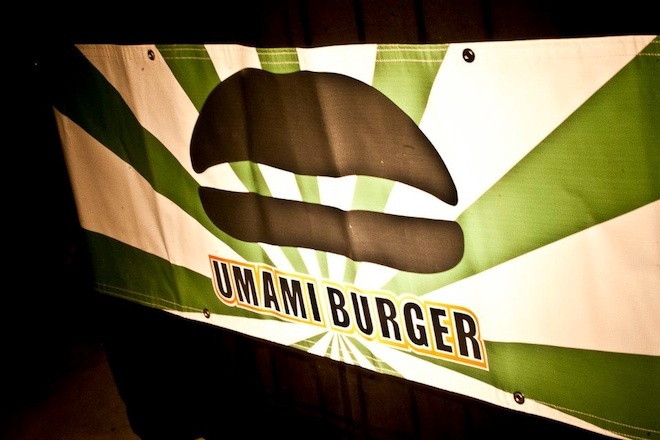 The umamification of New York City begins this July, as New York magazine reported this week in a lengthy profile on Umami Burger founder and president Adam Fleischman. (Which follows our own profile on the restaurateur, published last May.) The Umami concept is quite a thing—neither a fast casual restaurant, nor a chef-driven bistro—it has almost instantly become a part of the burger consciousness in Los Angeles. It’s hard to believe that in just four years, Fleischman’s original $40,000 investment has turned him into a modern day burger king. After getting the necessary Shake Shack comparisons out of the way, New York reveals a little bit more about Umami’s foray into the Big Apple. Naturally, it wouldn’t be possible without some big gun investors: SBE and the Fortress Investment Group are backing Umami’s first three New York City locations, including one in Williamsburg. As in L.A., Umami’s New York locations will not be cookie-cutter reproductions of a single model. “They will be sit-down establishments—except for the Battery Park location—with a full list of cocktails and fine wine.” The beef for the burgers will be ground, hand-pattied, and cooked in-house. New York alludes to a special sous vide cooking method, followed by a sear, and a sprinkling of Umami’s signature seasoning. When we asked Umami reps about the process earlier this year, they could not confirm that all burgers were made in this fashion. And there’s still that discrepancy about who created the first Umami burger, the one with the mushrooms, Parmesan crisp, roasted tomato, and mushrooms. Fleischman says he did, while tinkering in his kitchen at home. Meanwhile, chef Ernesto Uchimura (Plan Check), who helped Fleischman open the original Umami Burger on La Brea, says he created the process by which all Umami burgers are now made. Perhaps the two will continue to agree to disagree. Fleischman knows there may be some hiccups in New York, what with the whole East Coast / West Coast rivalry in all things, even food. (New York alludes to this as a reason for why Shake Shack hasn’t come West and In-n-Out isn’t going East.) But he’s determined to push on, even as he has half a dozen other concepts in the works, including: Roadhouse L.A. (a BBQ joint at the Improv on Melrose), L.A. Creamery, and the imminent expansion of 800° Degrees. Besides a “mind-blowing” duck burger and a vaguely Hawaiian-sounding creation called a Loco Moco, East-coasters should get excited about Umami’s newest creation. Just for New York, Umami will unveil a French-dip burger, “made with braised beef and served with umamified gravy on the side,” it will be an ode to the original L.A. classic, and perhaps a little nudge in the side of New York’s sometimes pompous attitude towards L.A.’s food scene. Some Advice for New York Chefs Opening Restaurants in L.A.